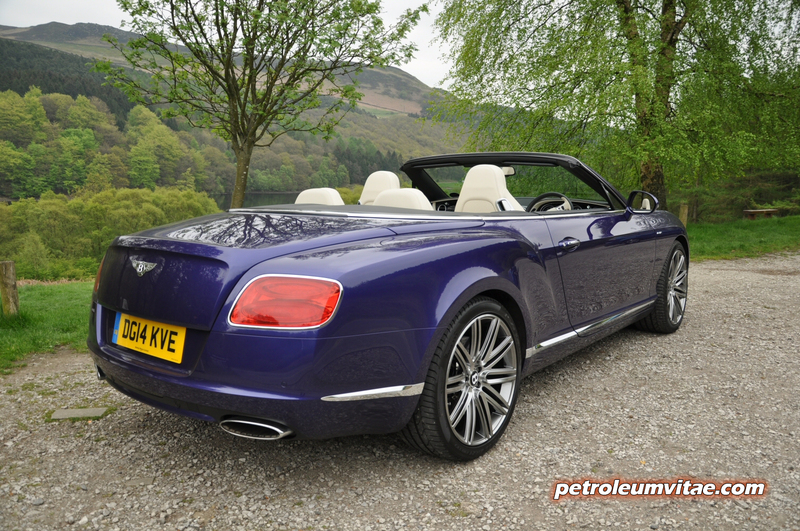 In a review referencing Sting, East 17, pints of milk, jumpsuits and basic geology, I had the privilege of spending a week living with what I consider to be one of the most beautiful cars in the world, which inadvertently costs more than the average semi-detached house in the north – a Bentley Continental convertible, in range-topping W12 Speed guise. Oh boy. 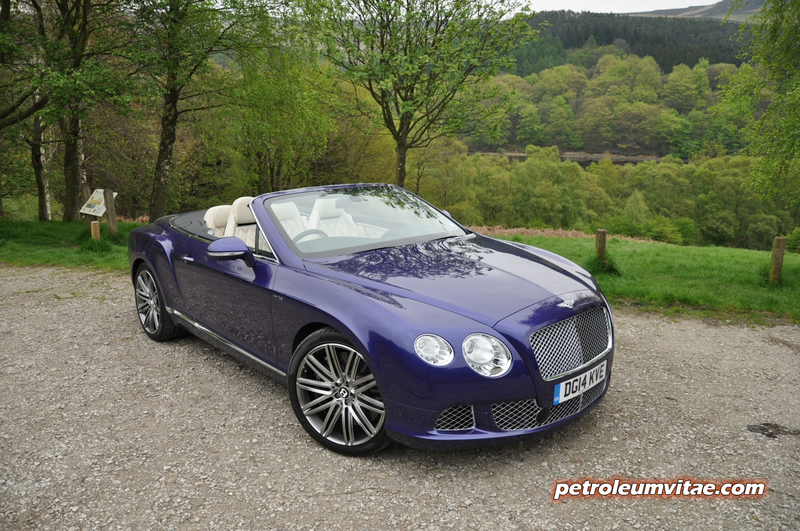 Incredibly and admirably, in equal measure, the general styling of the Bentley Continental GT has hardly changed since it was launched as a coupé grand tourer in 2003, followed up by the GTC convertible version in 2005. 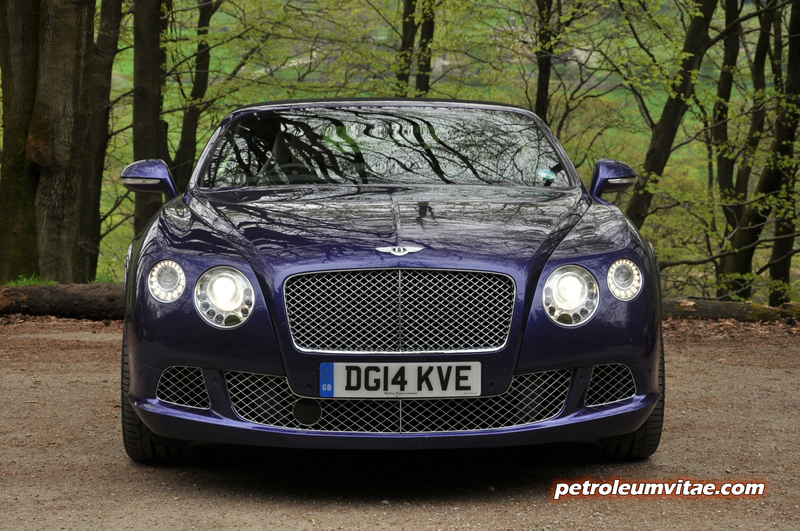 Bentley’s restraint in not significantly tweaking and twiddling the Continental GT/GTC is a good move in my view, as for the last decade it has stood proud as one of the most elegant and downright imposing cars on the road. Admittedly the broader market reach of the Continental GT has resulted in some associating it with footballers, general celebrities and lottery winners – but in any market, buyers typically gravitate to the best on offer, rather like the relentless march to buy Nissan Qashqais and BMW 3-series. From pre-owned 2003 examples upto this brand-spanking-new GTC which was in my possession for the last week, the styling of and ethos behind them has essentially stayed the same bar some very subtle visual updates such as a bolder grille, glitzier headlights, chrome surrounds to the rear light clusters and a few other nips and tucks to increase aerodynamics, reduce weight and add that extra dash of visual appeal and freshness. 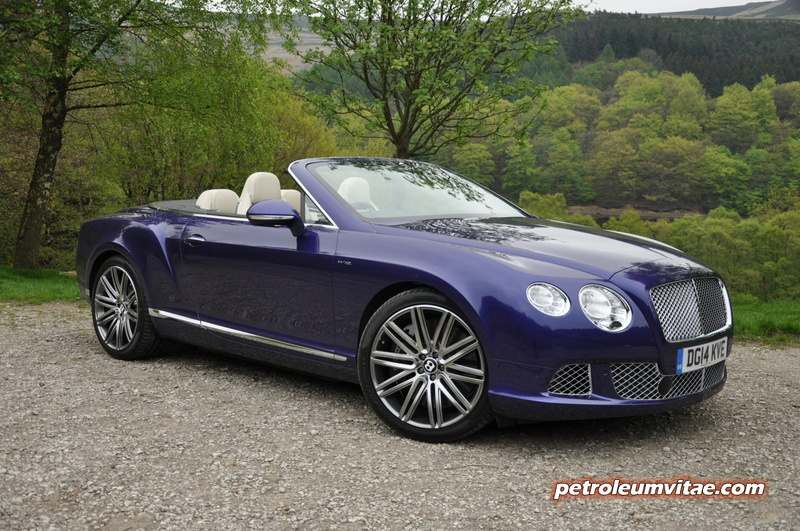 The Continental GTC W12 Speed is Bentley’s flagship soft-top and the one I was given sported jaw-dropping 21” Speed alloy wheels with a dark tint finish also given to the bumper air intakes, a gaping, bright chrome matrix-style front grille and equally gaping exhaust surrounds, various chrome trim around the sculpted body, and Azure Purple paint, which I was initially divided about but grew fond of throughout the week. Okay, this particular colour may not be to everyone’s taste, but few would argue that the GTC isn’t a majestic sight to behold. 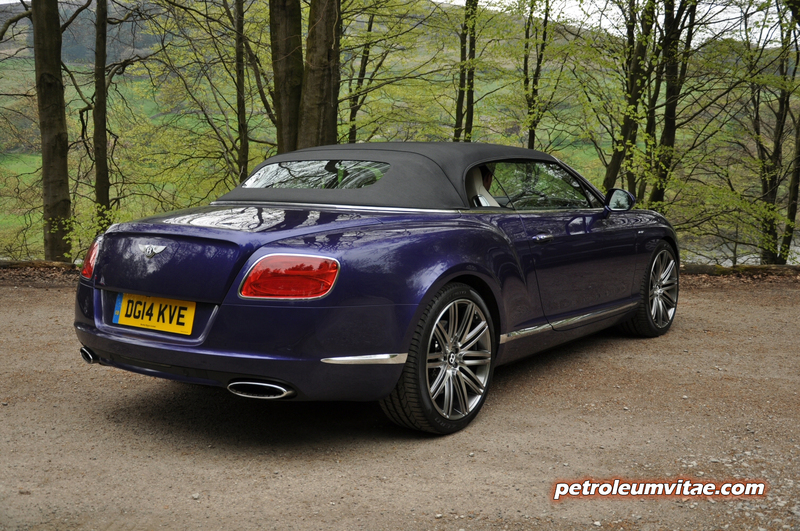 The day before it arrived, I listened to Sting’s Last Ship album, and casting my eyes on and then driving this Bentley made the words to ‘Ballad of the Great Eastern’ come flooding back to mind. Lyrics like “build the greatest ship afloat, and rule the ocean’s swell…Nineteen thousand tons of steel they used to shape the mighty keel…And now upon the open sea, the mighty ship did plough” could aptly be applied to this colossal but beautiful motor car. During the week I also ended up waxing lyrical about it looking like it’s been expertly sculpted from one huge lump of rock, initially thinking indestructible granite but then moving on to beautiful although perhaps more delicate marble. 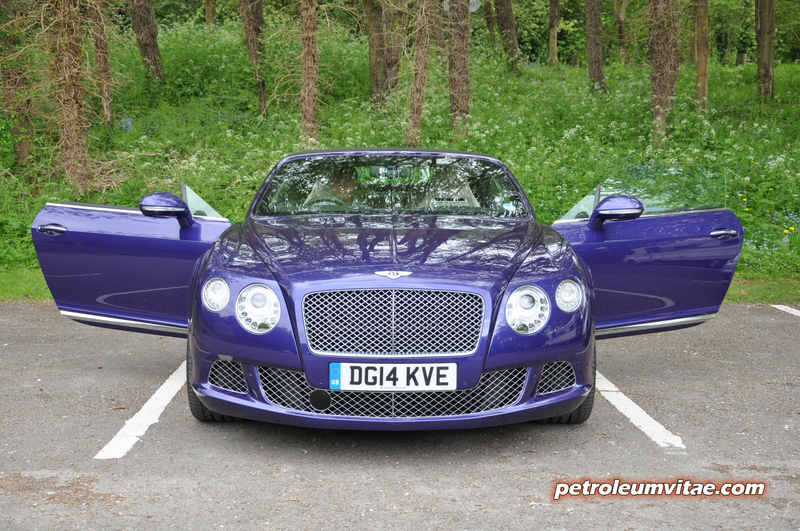 Everywhere I piloted the Bentley, kids tugged at their parents’ clothes and pointed at it, fellow motorists ogled and pedestrians gazed in wonder. Okay, it did attract a handful of vituperative comments, but on the whole, everyone loved feasting their eyes on it. 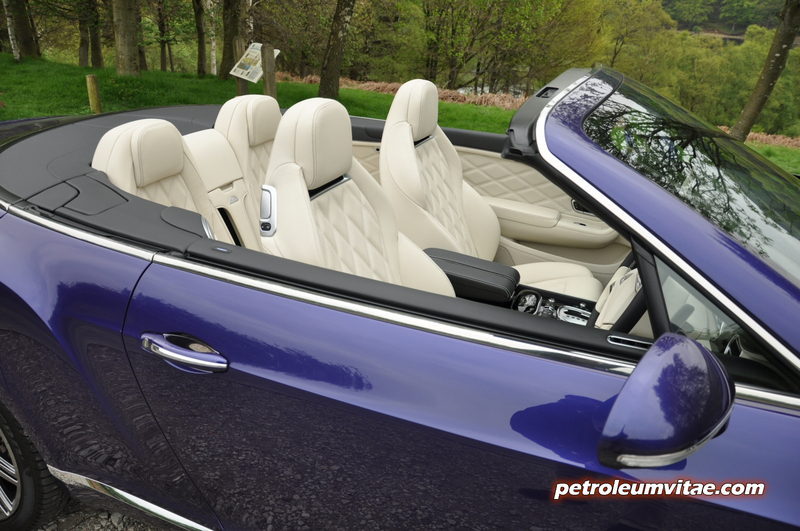 I’m not a massive fan of convertibles if I’m frank, but this one is undeniably, achingly beautiful – although I would order mine in a more subtle colour. 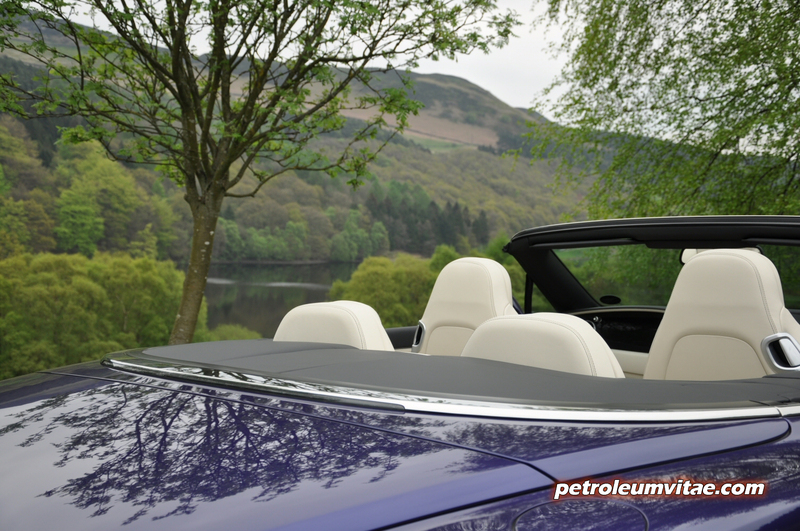 Roof up or roof down and from any angle, I could quite happily erect a deckchair, pour a glass of Pimm’s and sit looking at the Bentley GTC all day long, let alone drive it. 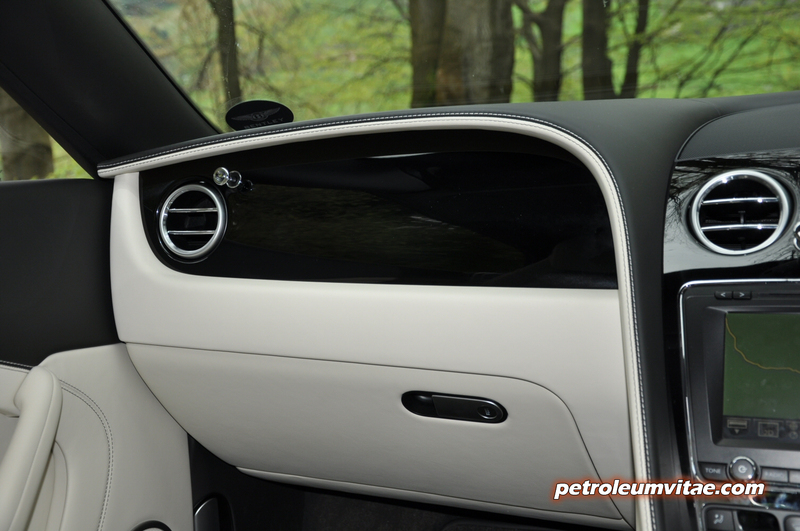 Having just said I could happily gaze at the GTC all day, I could happily sit in it all day long too, as the handcrafted interior is as phenomenal and marvellously well-built as the exterior. 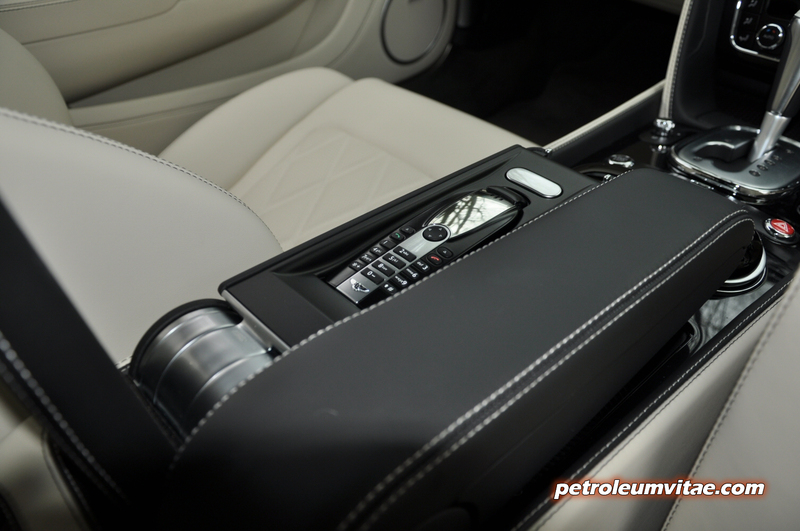 Everything about it oozes luxurious sophistication and beauty. 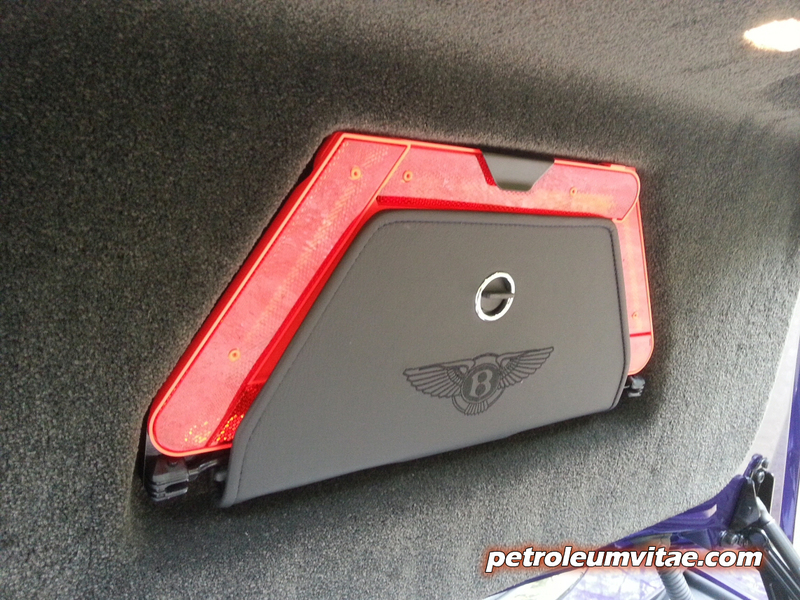 ‘Speed’-branded treadplates greet you as you open the long, substantial doors, opening up a fabulous lounge of opulence, with exquisite, quilted leather door trim, subtle and effective Piano Black veneer, creamily soft leather seats with contrasting stitching, a Breitling clock in pride of place, a Bentley-branded sunglasses case which sits under the beautifully-finished twin centre armrests (one of which houses the car’s cordless phone), a large, touchscreen infotainment system with DAB digital radio, a hard drive, sat nav and various other entertainment and car configuration functions, plus heated and cooled massage seats, SIM card integration, hide-trimmed steering wheel and paddleshifts, a reversing camera, carpets the thickness of those in a 5-star hotel, and drilled alloy pedals. 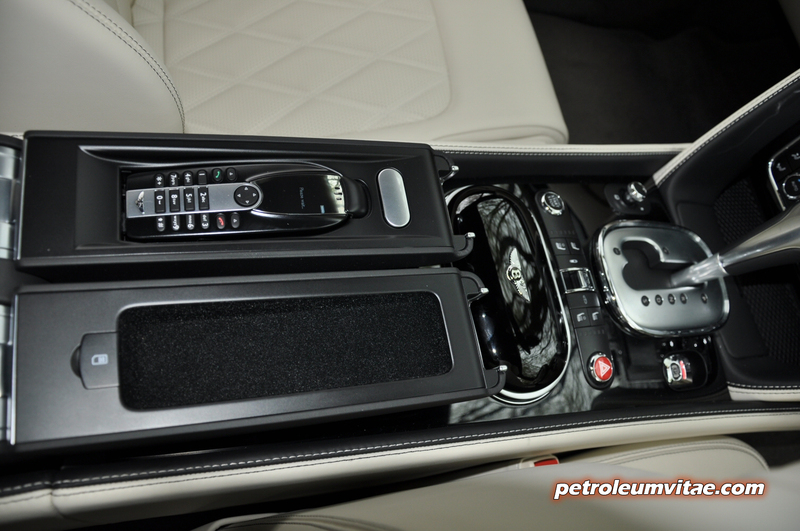 Yes, the interior specification is immense – and I haven’t even mentioned the Naim for Bentley sound system, which is the best in-car setup I’ve heard, by a country mile. 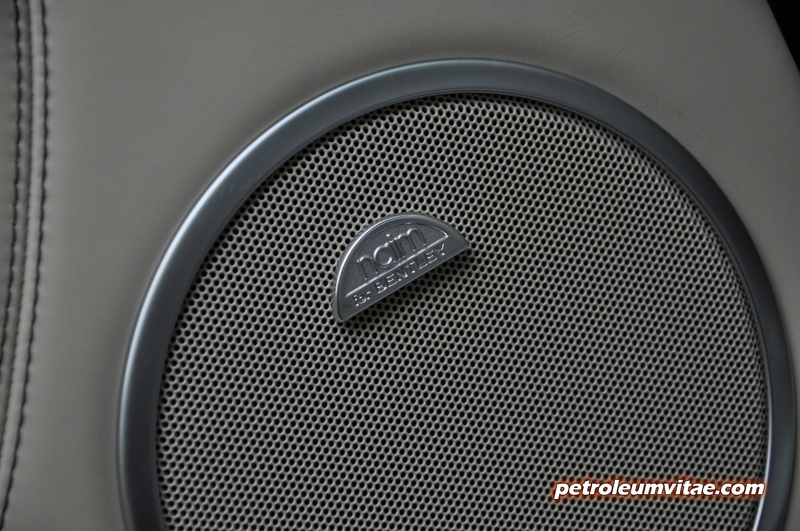 For me, it beats a Mark Levinson or Meridian system and just sounds remarkable. 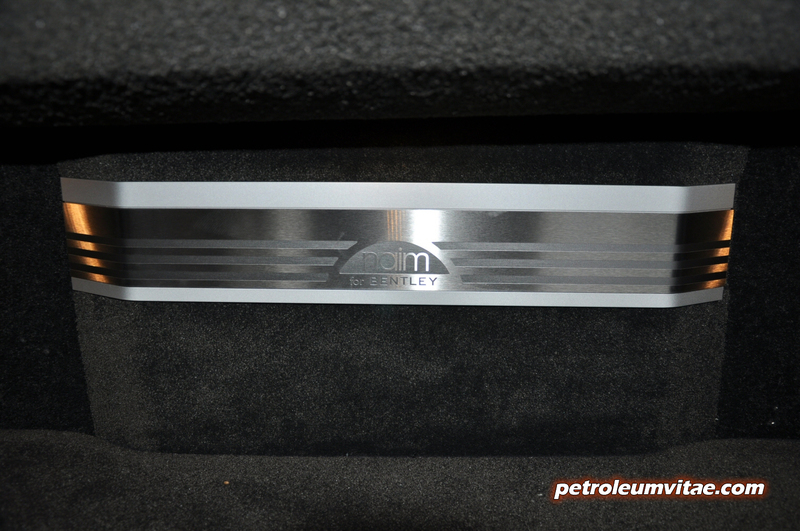 Thanks to Bentley for filling the hard drive with a great selection of music to show off the Naim’s capability, from Pink Floyd and Elbow through to Elgar and Daft Punk. No matter how high you turned up the volume, distortion is non-existent. It cleverly adjusts its settings when the roof comes down, so no matter what the scenario, you’re in for an aural treat. Nothing is perfect, though, and I did find a few slight negatives. The scroll-wheel for the trip computer sometimes proved fiddly and I found it hard to find the fuel consumption readout, the Bluetooth phone system disconnected at random a few times, the position of the indicator and wiper stalks and the gearbox paddles felt too low and high respectively, I couldn’t find a USB charging connection despite searching high and low, and although it looked an absolute dream, the Linen colour of the main hide was always a worry so I used seat covers out of respect – or else the alternative would be for my fellow occupants and I to wear seamless, felt jumpsuits, but we didn’t fancy looking like East 17. 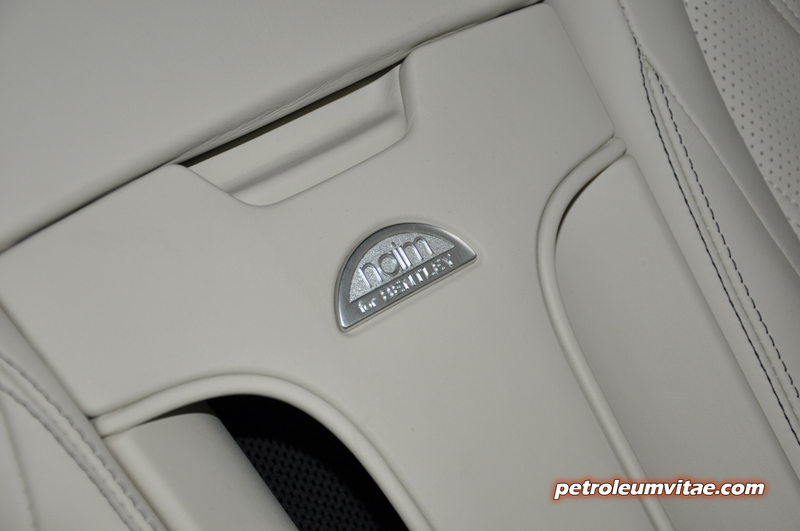 In terms of practicality and space, the front seats are flawless and can be adjusted as intricately as you require, so the GTC would make an excellent grand tourer for driving across the Continent in, funnily enough echoing its very name. 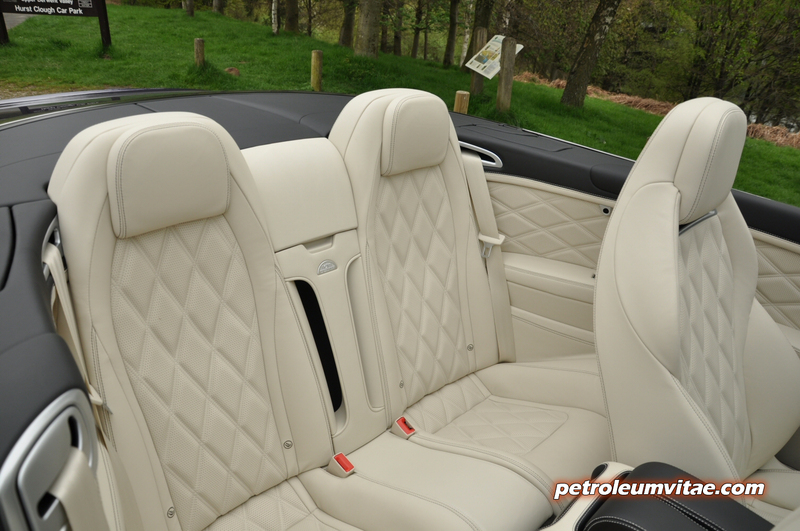 Characteristically of most convertibles, the two rear seats are fine for shorter journeys in the opinion of my passengers, so it’s doubtful that a GTC would suit regular use for three or four people. The boot, opened by pressing the B(entley) logo, is a decent size and although I’m not going to be drawn into talking about golf bags, I reckon it would be good enough for carrying the typical amount of luggage a couple would take on a road trip, for example. 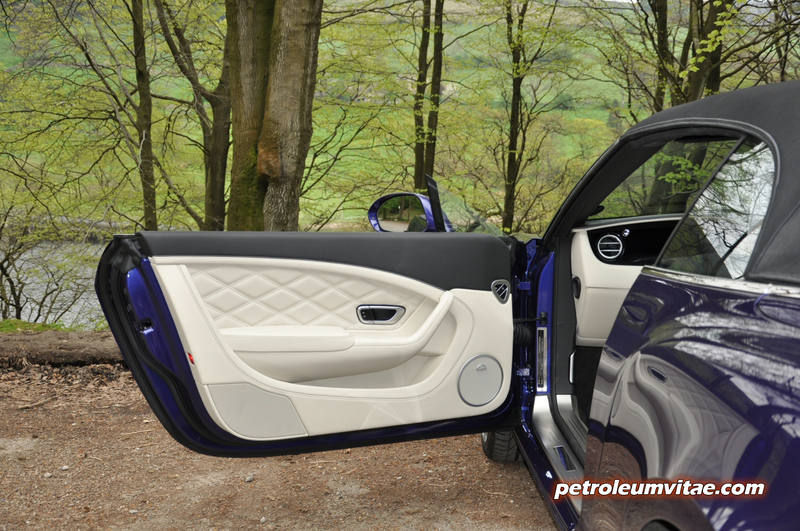 Other electric convenience features in addition to the boot included the seatbelt presenters which prevent you having to reach backwards, front seats which slide backwards at the touch of a button to aid entry to the rear, and the steering wheel rake and reach controls. 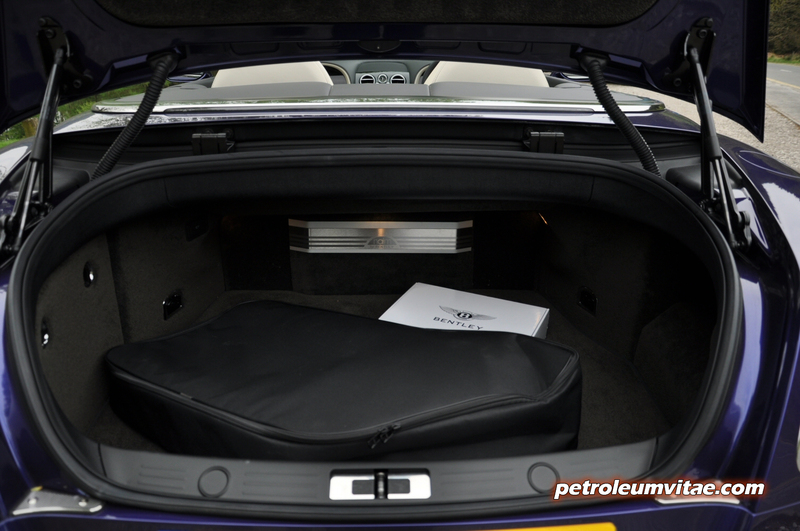 A space-saver spare wheel is stowed under the boot floor, and for driving with the door down, the front seats come with neck warmers, and a wind deflector is provided. 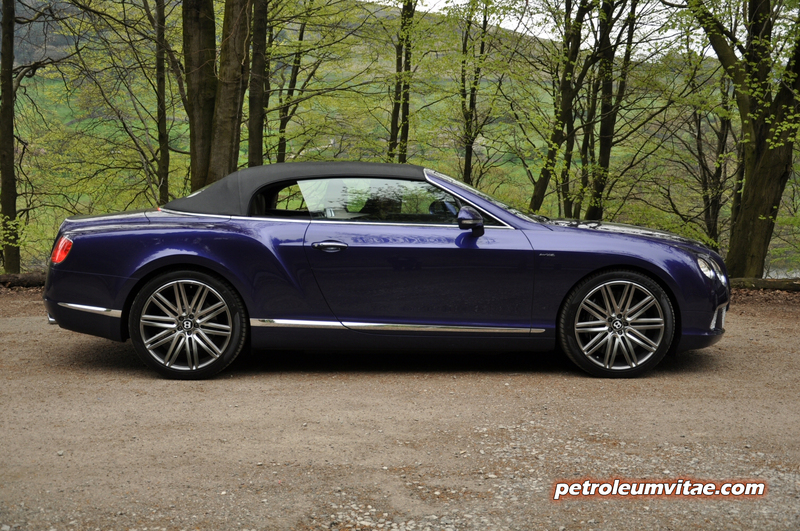 The sense of occasion each time you walk up to the Bentley GTC, sit in it and start it up is immense. 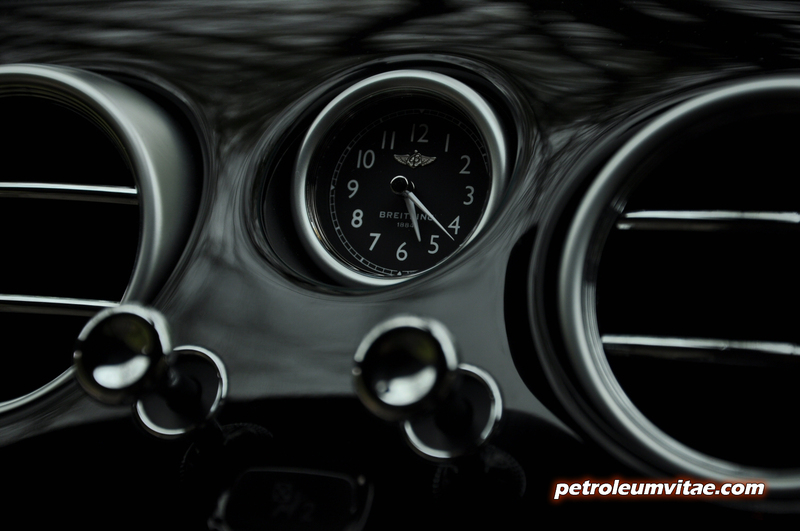 I’ve always been drawn to cars, small and large, old and new, that give you a special feeling – and this Bentley dishes out ‘special’ in bucket loads. Imagine the sense of occasion you feel when you put on your best suit or dress to attend a wedding, accept a business award or spend a day at the races. 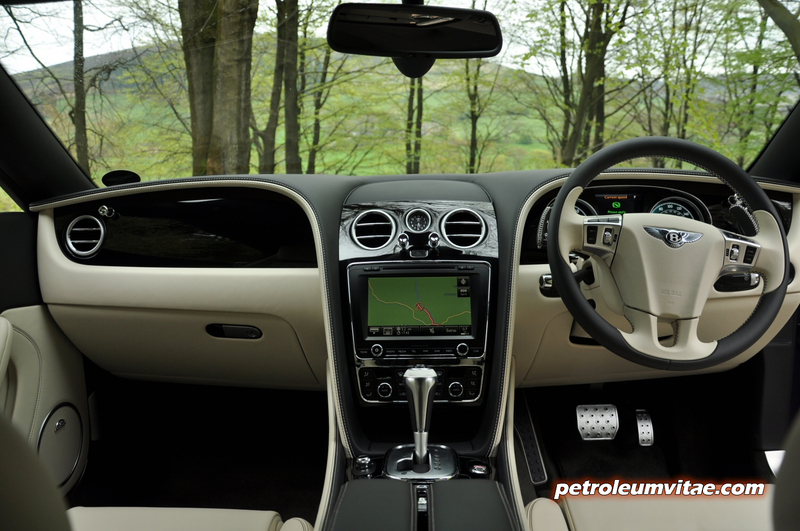 This Bentley kindles such a buzz each and every time you use it, no matter how short the distance. Popping down the local shops for a pint of milk or even just moving the car to put the weekly rubbish bins out brings a smile to your face. 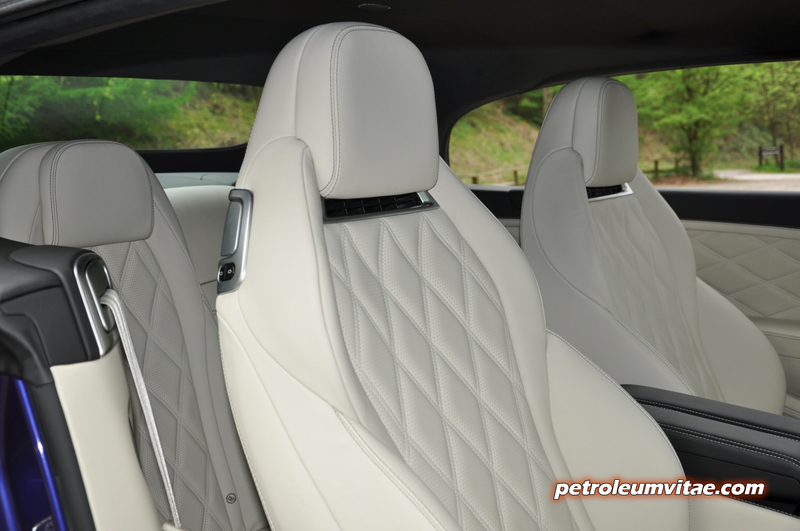 Overall, then, the Bentley Continental GTC’s interior is one of the most luxurious on the market and really is a wonderful place to munch galactic distances from, although think of it more as a 2+2 in practice, rather than as a true four-seater. 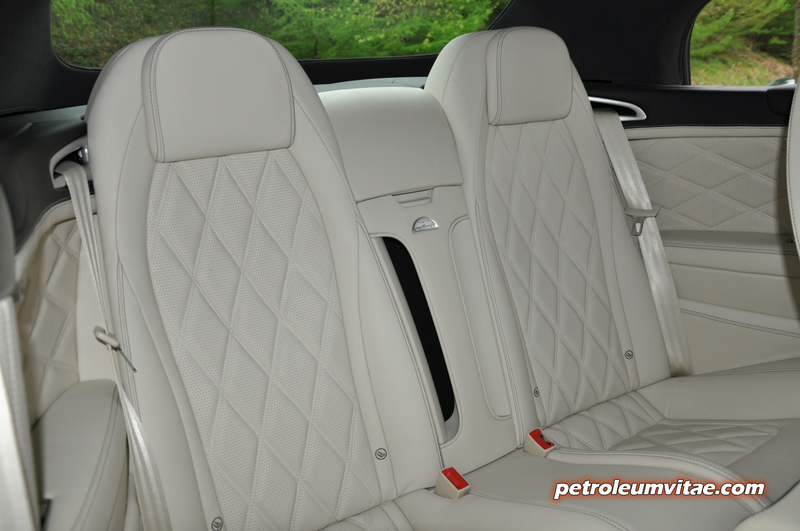 Depending on your nerve levels when it comes to dirt, Bentley offer you an almost unceasing amount of customisation, so it goes without saying that buyers will be able to tailor the interior so that it’s just right for them. 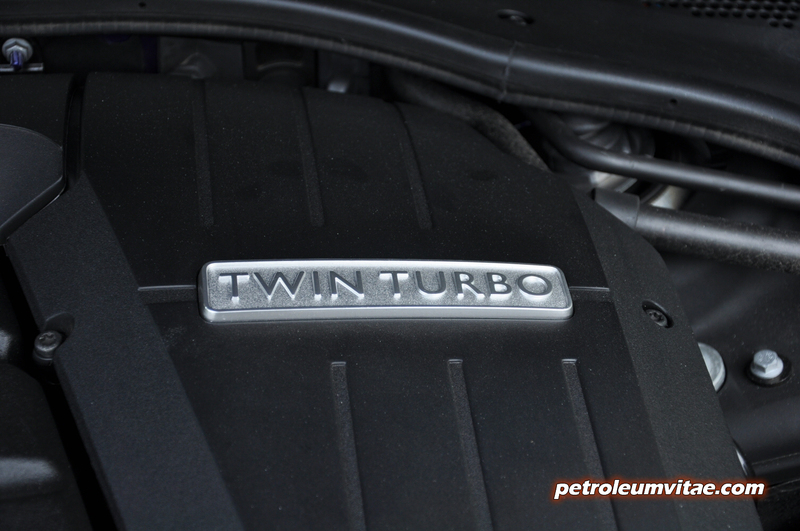 Bentley have recently introduced a twin-turbo V8 to the Continental range, but I was delighted to be able to spend quality time with their stalwart, 6-litre, twin-turbo W12. It’s a Volkswagen engine that’s been around since 2003, used in the VW Phaeton and the Audi A8, appearing in Transporter 2 with Jason Statham. 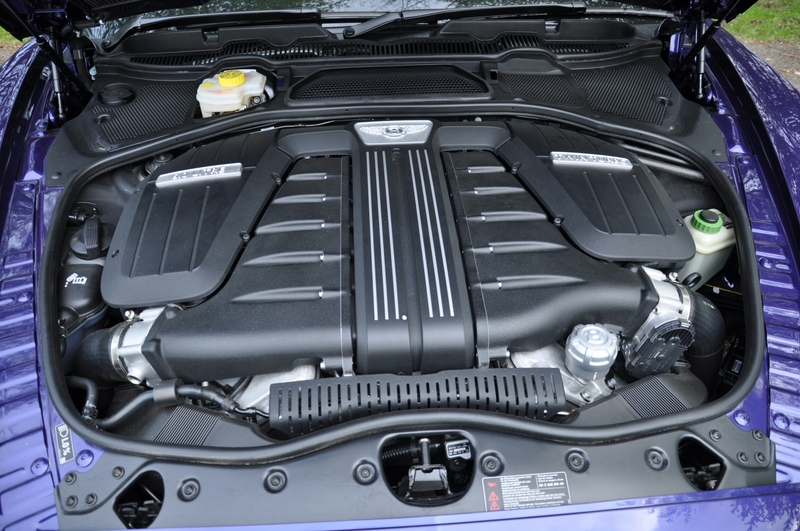 Effectively, in very crude terms, it’s two V6 (well, narrow-angle VR6, to be more specific) engines joined in a W shape, and the W12 has always been renowned for its tremendous pulling power and top speed. 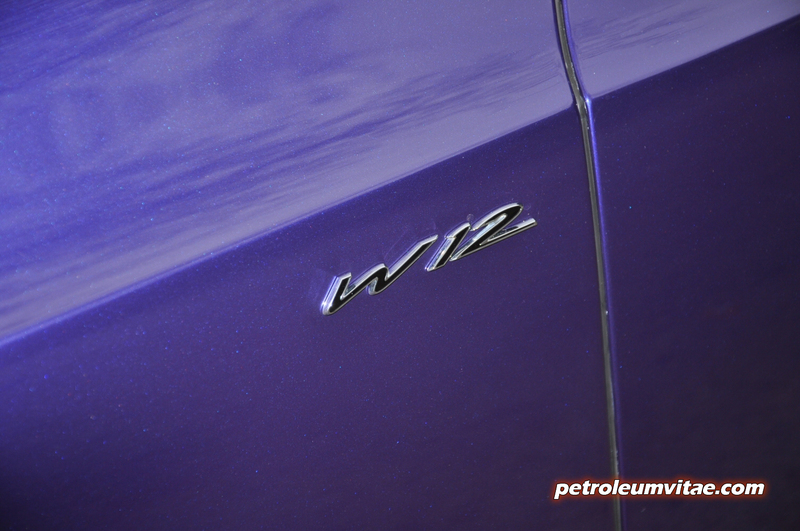 Owing to its efficient use of space, the W12 gave Volkswagen the opportunity to use it in conjunction with four wheel drive, resulting in a rather potent recipe. 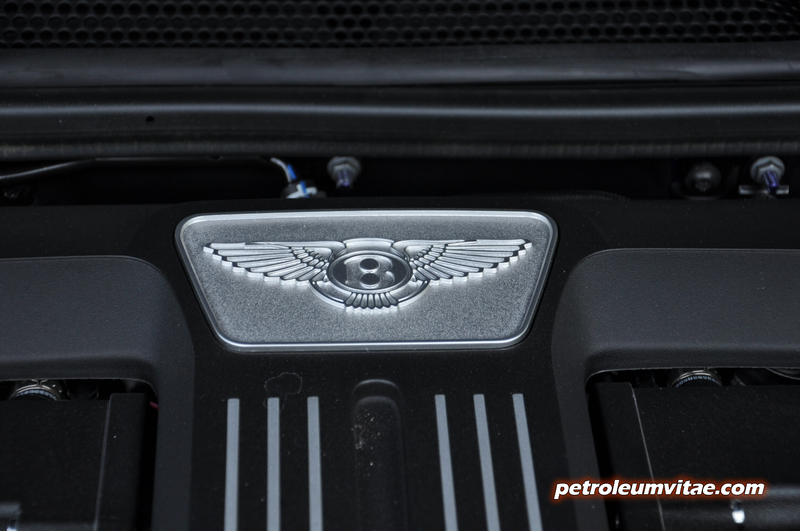 In Volkswagens and Audis, the W12 produces upto 444bhp, but Bentley throw a couple of turbochargers into the mix to give their W12 cars 553bhp. 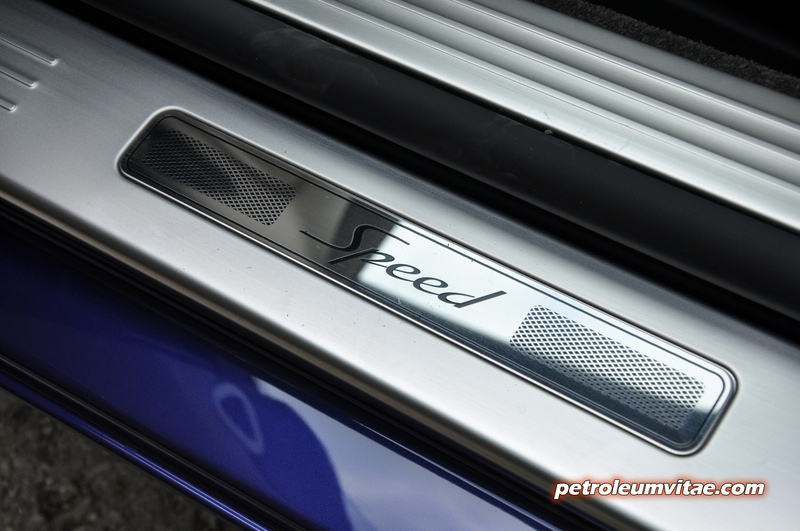 The ‘Speed’ model has always had even more power squeezed out of it, originally offering up 602bhp along with upgraded suspension, anti-roll bars and other components to cope with the power increase. 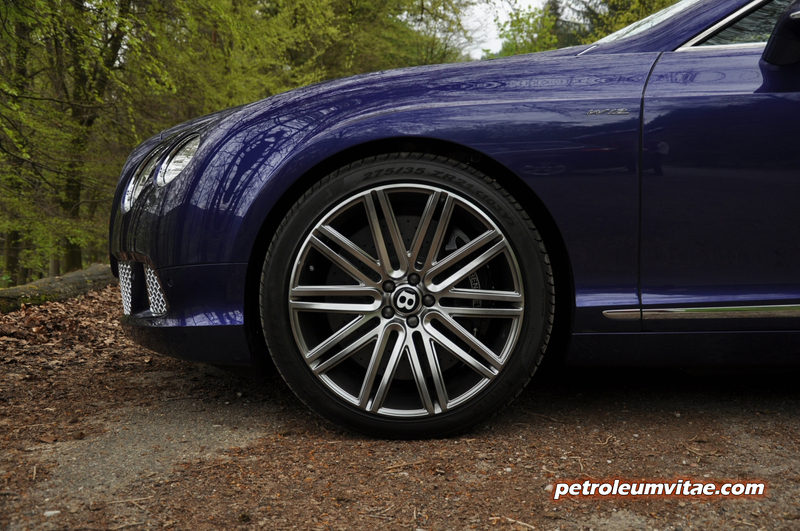 When the second generation Continental models were revealed in 2012, Bentley upped the W12 to 616bhp – and this very latest Speed I drove for the week came with 10 more horses. That’s right, 626bhp in total. 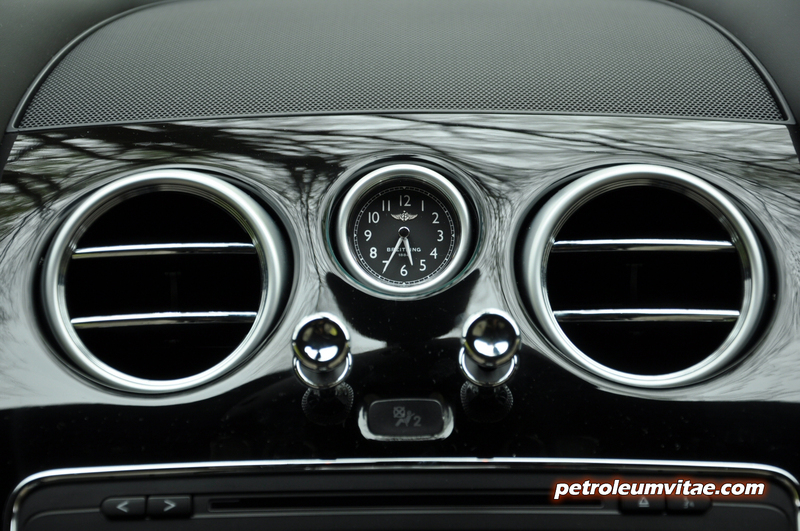 What’s perhaps more impressive still is the torque figure, which stands at 820Nm. 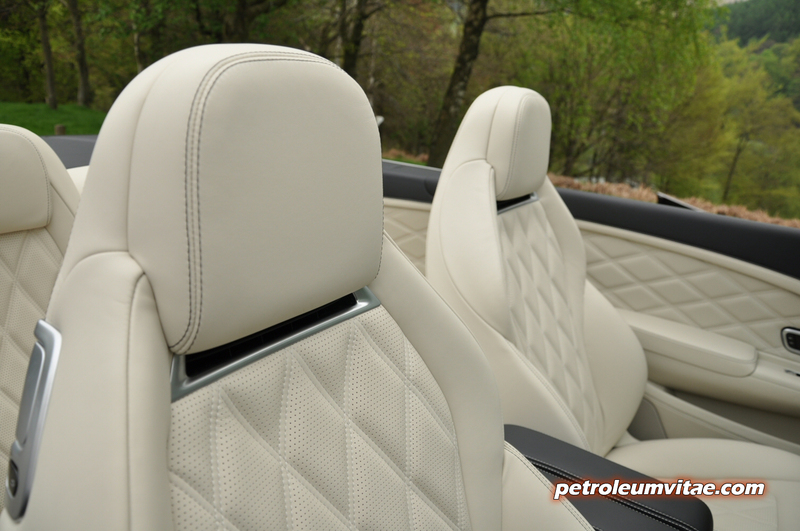 By way of a quick comparison with other convertibles which may loosely be considered as alternatives, the Aston Martin DB9 Volante provides 510bhp and 620Nm of torque, the Porsche 911 Turbo S Cabriolet 560bhp and 750Nm, the Maserati Grancabrio 444bhp and 510Nm, and the Mercedes-Benz SL65 AMG 630bhp and 1,000Nm. 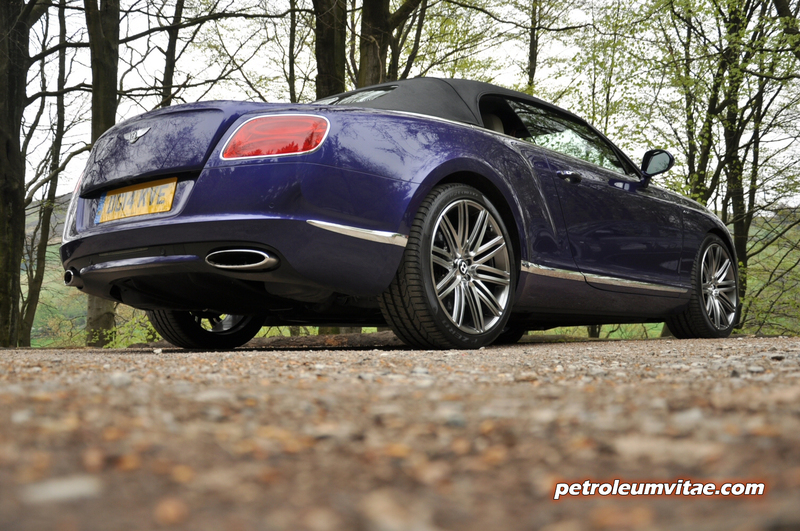 So the Bentley GTC Speed is one of the beefiest drop-tops out there – and it’s got to be, as it has a kerb weight of just under 2.5 tonnes and its gross weight is a fraction under 3 tonnes. 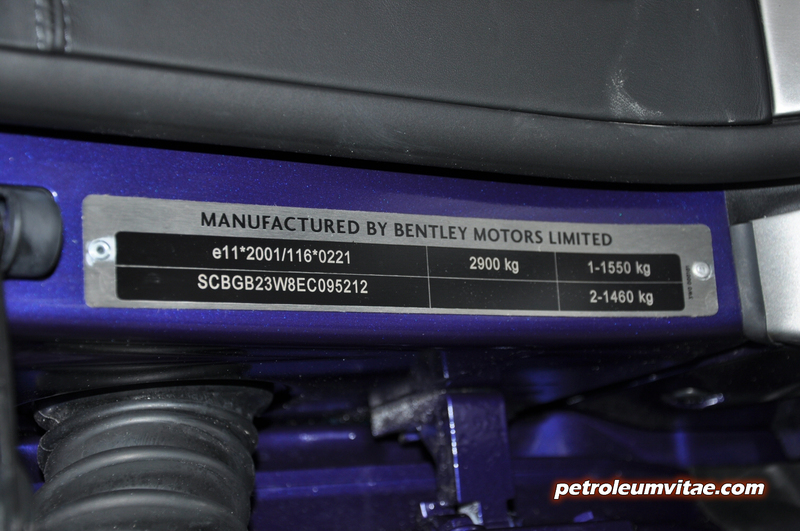 You’re all dying to know if the Bentley GTC W12 Speed feels as powerful as its statistics, and the answer is yes, very – and then some. Push the start button and it fires into life with a lovely, deep-throated boom, which then fades into a throbbing rumble. 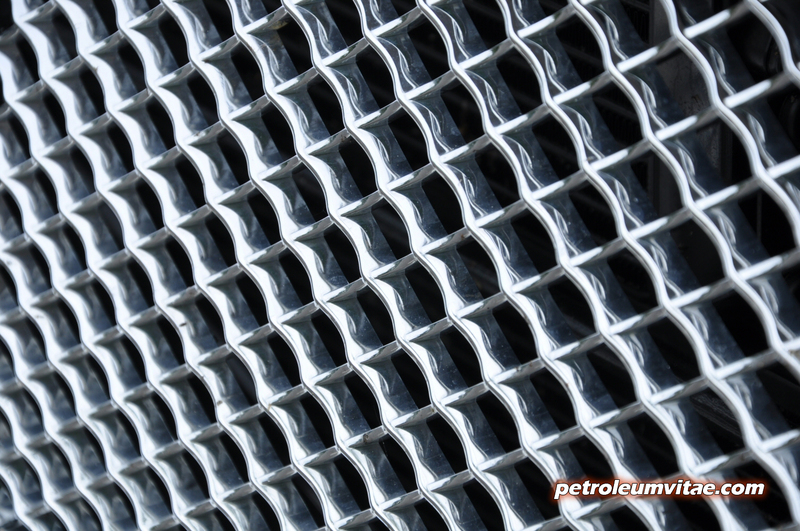 Many car fans prefer the performance and tone of a V8, with V10 and 12-cylinder engines typically being quieter. The W12 engine isn’t as shy as I thought it might be and is actually quite vocal, so I knew as soon as I edged out of my drive that I would relish the week ahead. Just lightly pressing the accelerator, you instantly know Vesuvius is there to propel you forward. In normal ‘D’ mode, there’s a bit of lag at times, but then once all the brute power is delivered, you’ve immediately forgotten about that as you’ve hit the horizon, the W12 surging forward with turbine-like precision. Mincing around town, the ride is very refined, serene and cocooned, with a faint burble and boom soundtrack discernible from the exhaust as it downshifts and generally has a blissful conversation with itself. 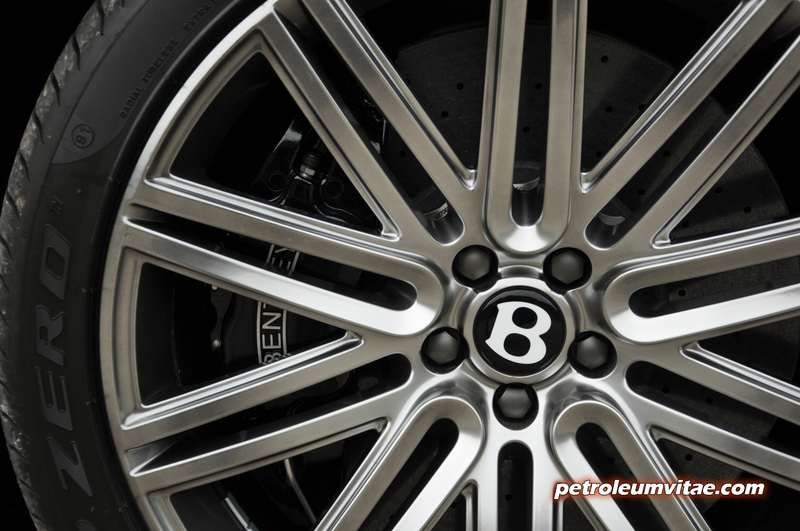 The Bentley is gargantuan in size, there’s no doubt about it, but it isn’t that difficult to pilot around narrow streets and the like. 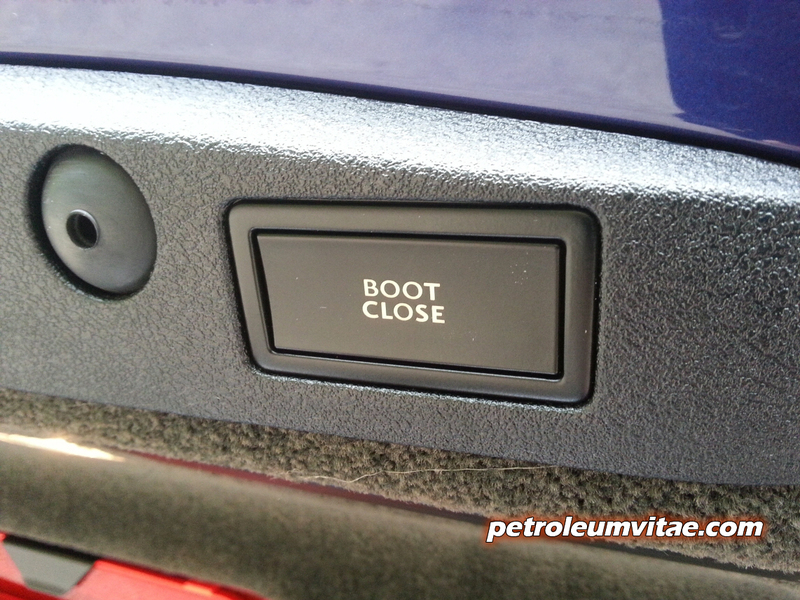 Reversing is a relative doddle as it’s fitted with a reversing camera. You just need to choose your parking spaces wisely, as you can imagine. On the motorway, leave it in ‘D’ and it’s happy to cruise along all day at 70mph, is as hushed and comfortable as any luxo-barge and I even got it to return 23mpg on a sensible run from Telford to Manchester. It’s a shame I hadn’t been commissioned to drive it on a featured road trip across Europe and way, way beyond – it really is that refined and offers a staggeringly addictive drive, at any speed. The potent W12 powerhouse is gagging to work up a sweat, though, and like most people in their right mind, I looked forward to the opportunity to try out its sporting credentials from time to time. 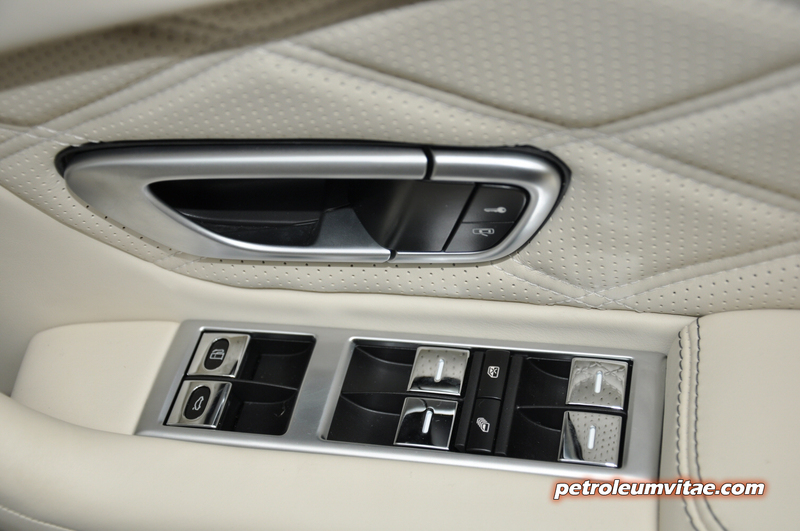 Shift the selector into ‘S’ and it becomes a different beast in an instant, with an acutely sharp throttle response, a heavenly exhaust note and crisped-up handling. 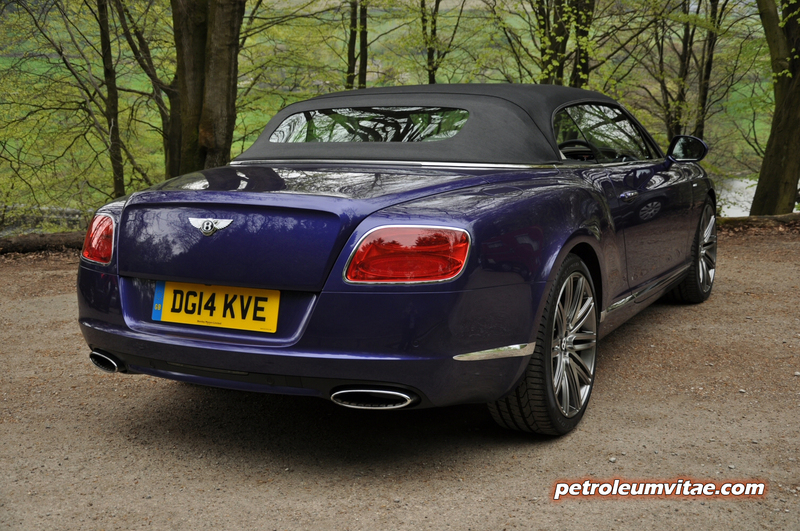 From a rolling start, floor it and the Bentley hurtles you down the road with seriously impressive force, but it’s almost more breath-taking when you floor it from around 60mph on the motorway to complete an overtaking manoeuvre. 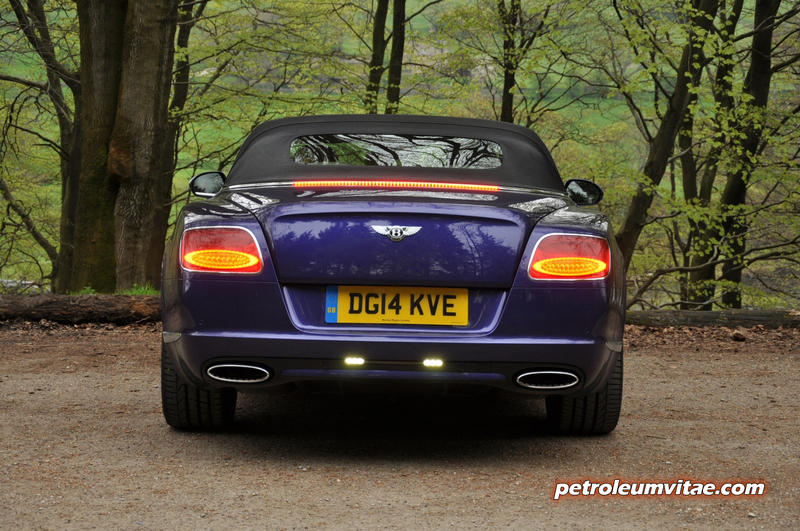 It really does feel like the W12 will never, ever run out of power. 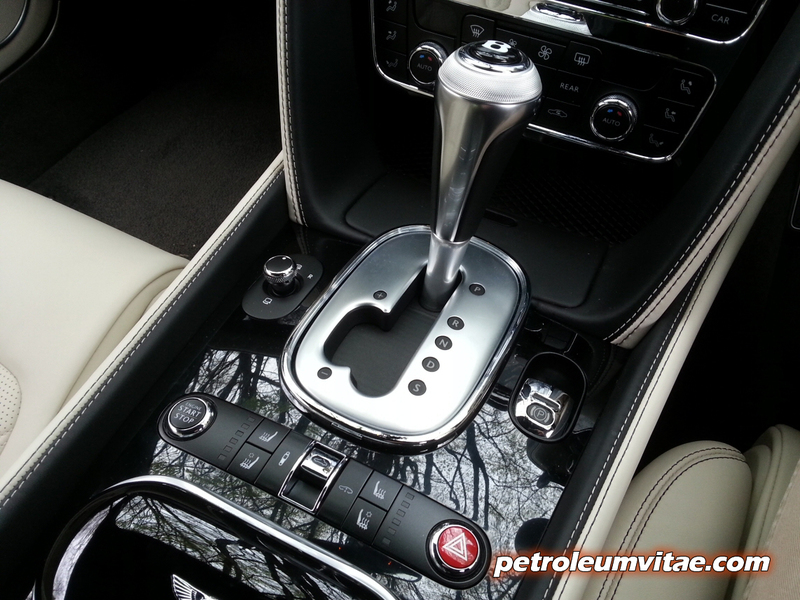 The 8-speed ZF automatic transmission is a wonder, as well, shifting remarkably smoothly and seamlessly. 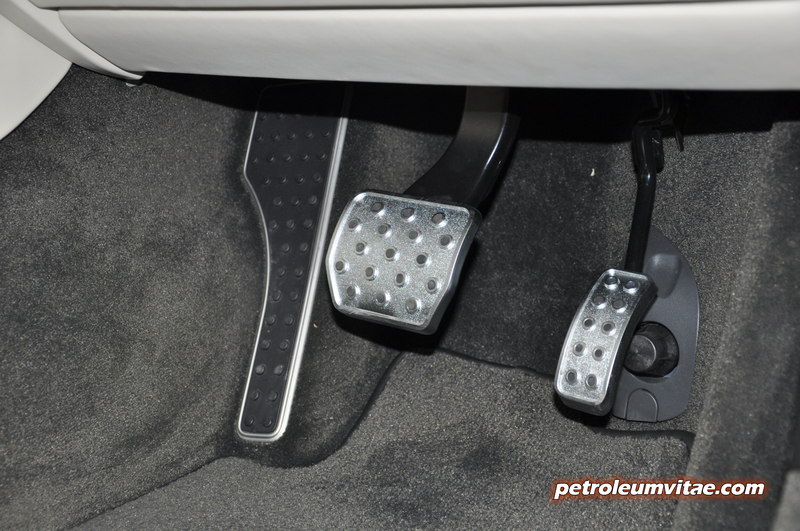 In ‘S’ mode, it’s programmed to be able to block-shift, such as from 8th to 4th, to allow eye-watering acceleration should you need it. 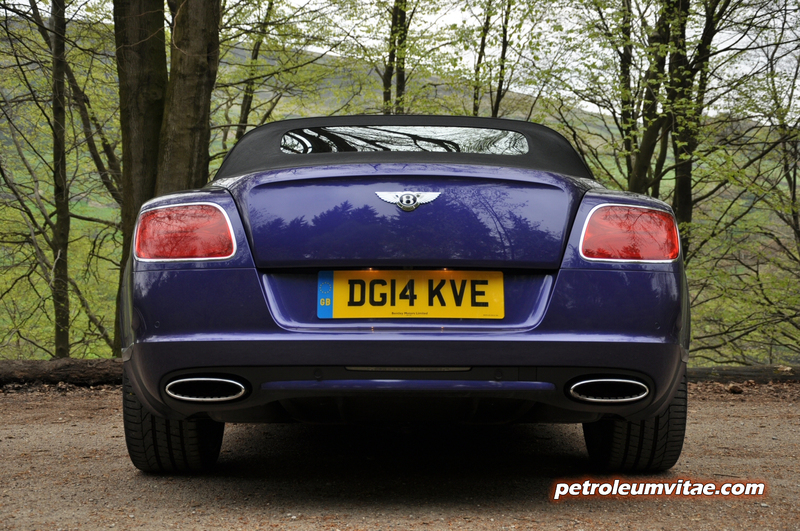 My reviews are all about real-world driving, though, so it goes without saying that within the confines of the law, it’s impossible to experience what this mighty Bentley is truly capable of. I haven’t mentioned its top speed yet, and it’s fair to say that it trounces most of its general rivals in this regard, too. 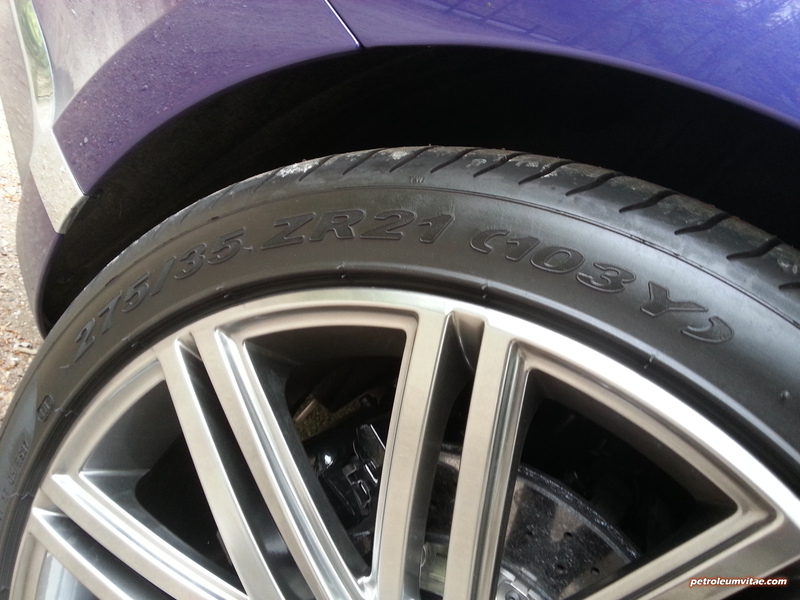 You only need to look at the figures printed on the tyre walls and the speedometer and the clues hit home. Its 0-60mph acceleration time of 4.1 seconds is entirely believable, but very few Speed owners will ever be able to test its top speed of 202mph, which is incredibly only a few mph less than its coupé sibling. 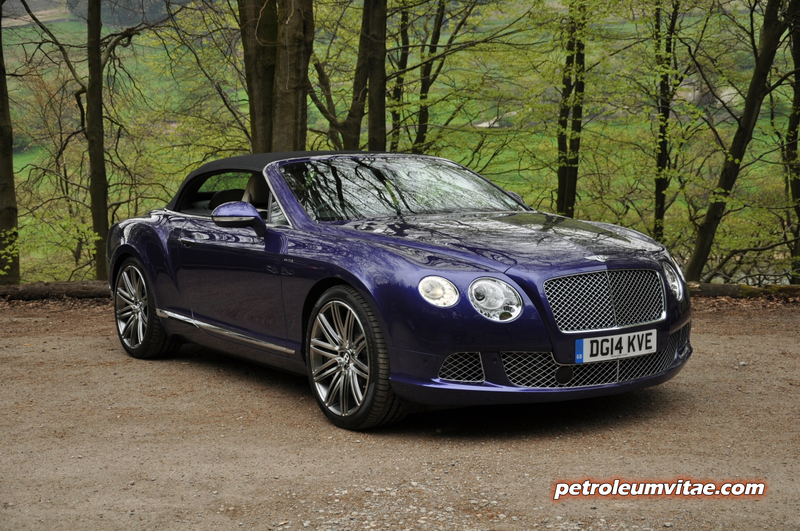 This is indeed the fastest four-seat convertible in the world. 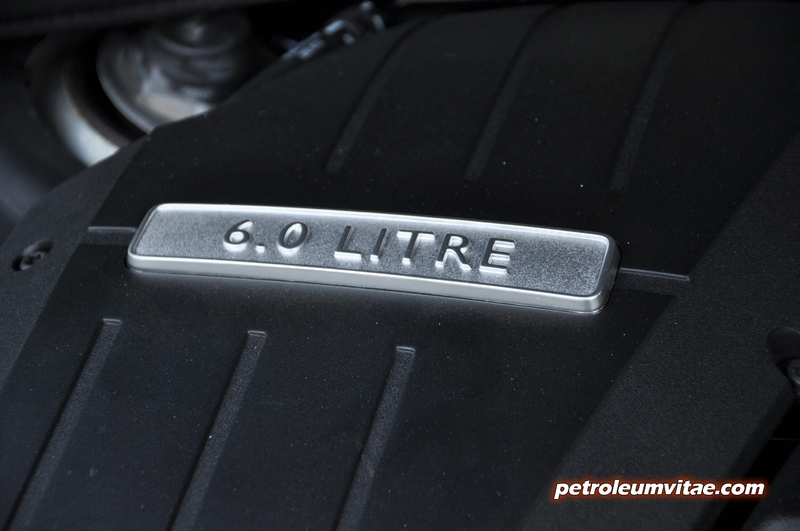 Not only the immensely powerful engine hides the GTC’s weight – its handling does, too. 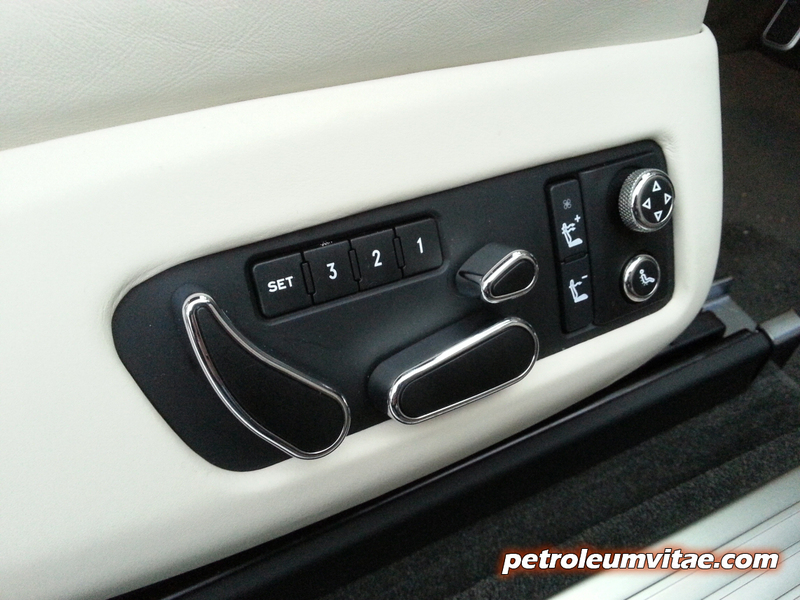 The air suspension is adjustable at the press of a button and can be set in Comfort, Normal, Sport 1 or Sport 2 mode. Set to Normal, the ride on 21” alloys is a wee bit firm, but reassuringly so. 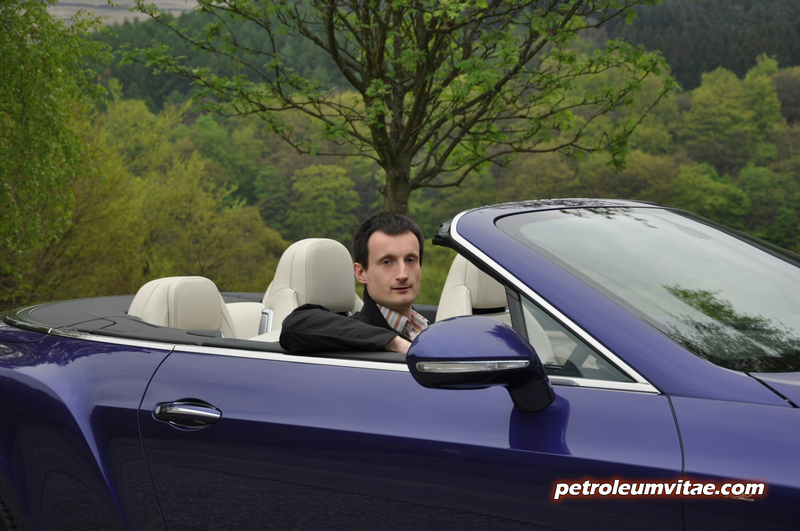 Comfort mode really is a revelation, soaking up bumps and potholes so much so that at times, the GTC felt like it was a magic carpet, gliding over the landscape. 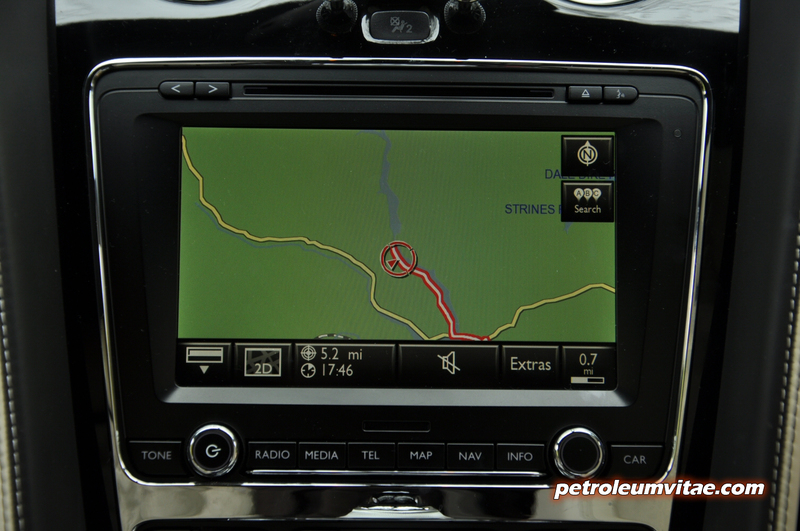 A great opportunity to test it in the Sport settings was on the route from Manchester to Sheffield over Woodhead Pass and then back west along Snake Pass, where the sports suspension proved that the GTC Speed really can be chucked around bends at pace, belying its size and weight. Not having driven it on a track, I can’t claim to have pushed it to its limits, but it’s fair to say that only a small amount of understeer will ensue when pushed hard, rather than any worrying oversteer. The Speed sits 10mm lower than the standard GTC and its upgraded anti-roll bars, stiffer bushes, tailored Servotronic steering and revised springs all contribute to its pretty incredible handling. With the roof down, a very slight degree of shake can be detected some of the time, but the GTC Speed generally lives up to its claim to be the most rigid, coupé-handling-like convertible around. 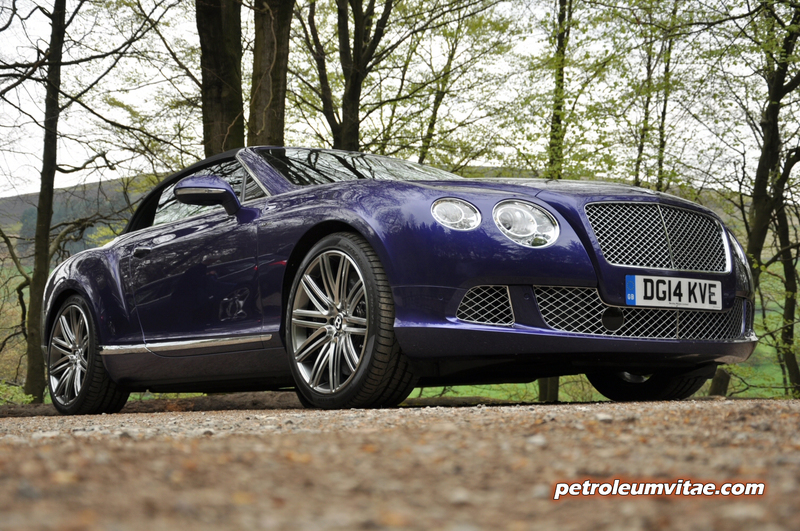 In addition to the Bentley’s permanent four wheel drive as standard, my GTC Speed was fitted with Carbon ceramic brakes for enhanced stopping ability. They’re a £10,405 option, by the way. All this performance inevitably comes with high running costs, with road tax of £1,065 per year and the 90-litre fuel tank providing a range of no more than 300 miles when driven sensibly. If you want to have your fair share of fun, you’ll be looking at about 200 to 225 miles from the tank at best, if not much less depending on how care-free you are. 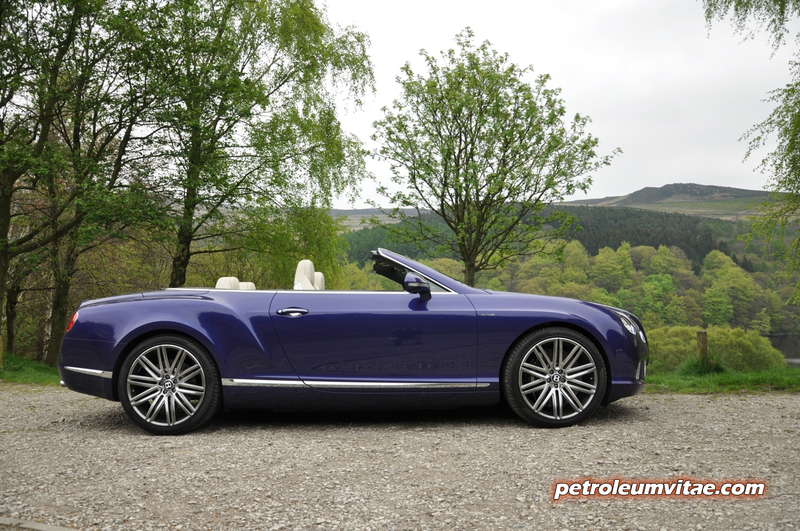 The Bentley Continental GT Speed Convertible has a starting price of £167,900 and once all the optional extras fitted to my test car had been totted up, the total came to £201,615. I’m not a ‘bigger is better’ kind of chap by pure default and you only need to think of an Audi Q7 and a Suzuki Swift Sport to see the reality of things, so I haven’t just heaped praise on the Bentley Continental GT Speed Convertible for the sake of it – I’ve done so because it really is that good, in so many different ways. 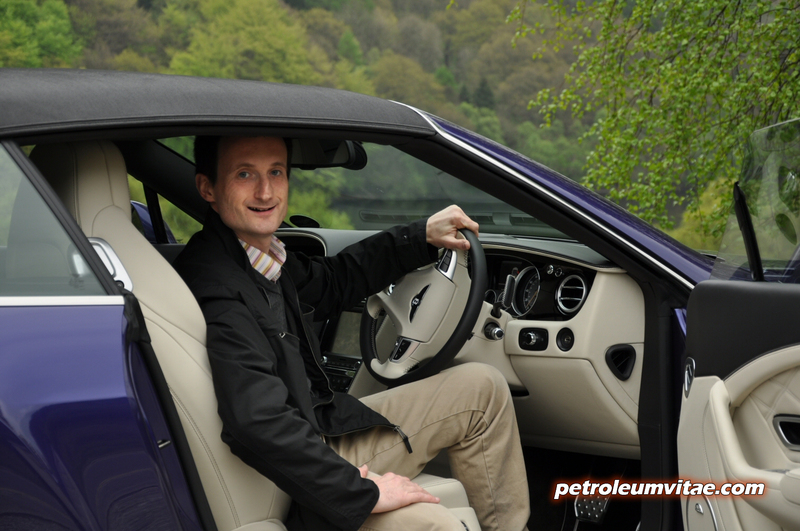 For one, it’s a brilliant grand tourer, able to swallow up hundreds of miles in supreme comfort, leaving you feeling well and truly satisfied at the end of every long journey – aside from your debit card having been flexed a fair few times, admittedly. It doesn’t happen that much in the UK, but if the sun’s out and you want a soft-top to cruise, mile-munch or even just show off in, this will do the trick perfectly, aside from rear space still being a tad lacking. And if you want an all-out sports coupé to take on a moorland thrashing along insanely fast straights and around sharp twists and turns, all you need do is put it in Sport mode with its accompanying Sport 1 or 2 suspension setting, and you’ll soon have a smile on your face, which will take some hours to shift even after you’ve parked up and gone indoors. 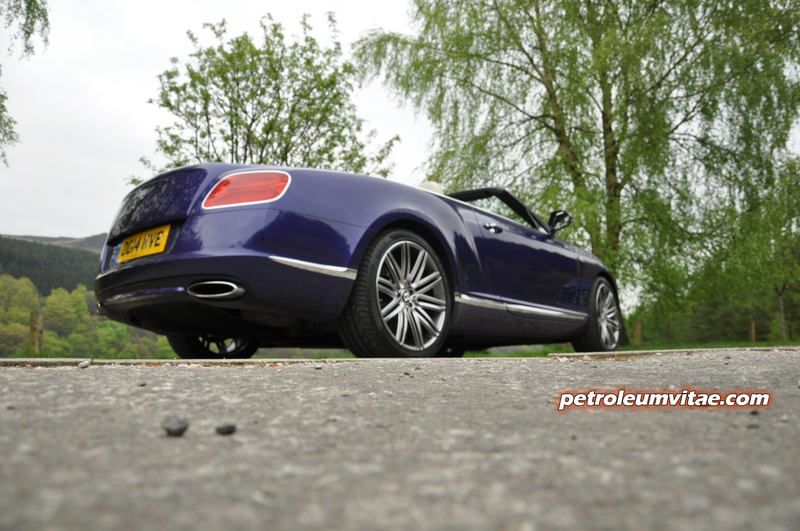 I know it’s not as economical, environmentally-friendly (347g/km CO2 compared to 255g/km) or as reasonably-priced as the new V8 (from £140k-ish for the non-S) model, but from my week with it, I can say that the Bentley Continental GTC Speed W12 is a very credible all-rounder, with stunning build quality, huge presence, a wonderful sense of occasion and remarkable performance to suit everyone who can afford to buy and run one. 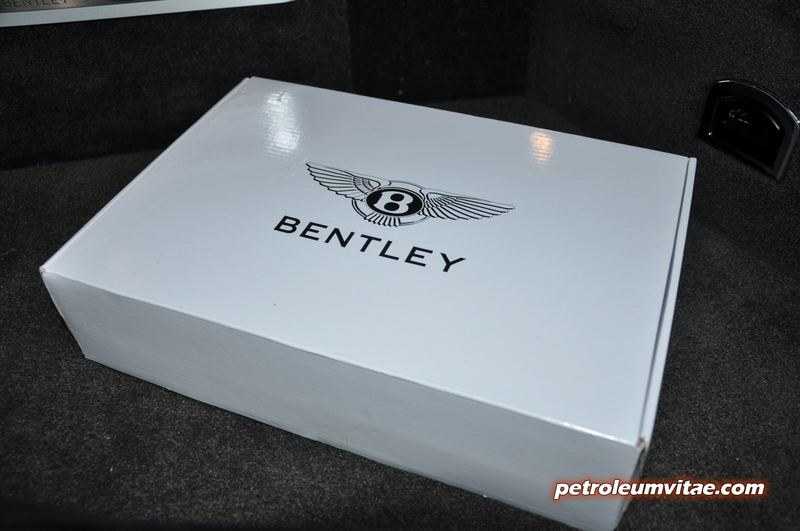 A big thank you to the Bentley team. 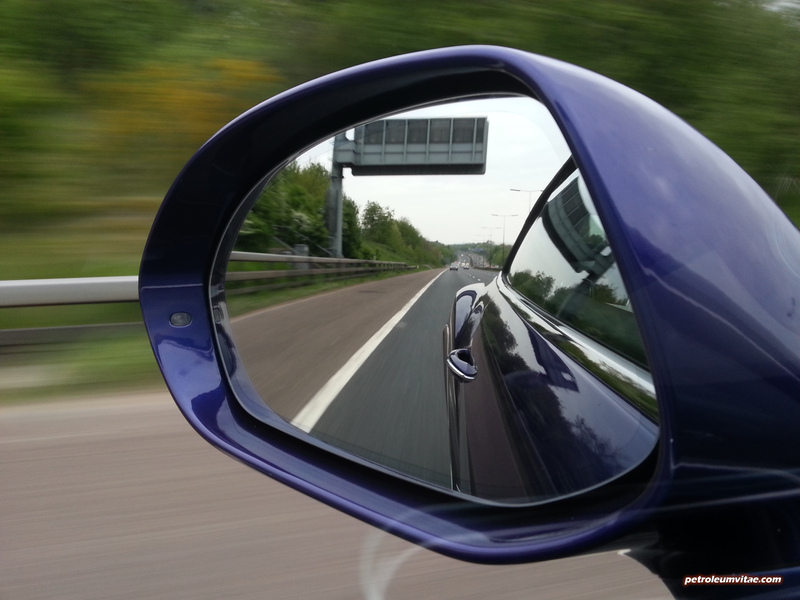 Mmmm, great idea – the UK down to Barcelona in a GTC Speed! 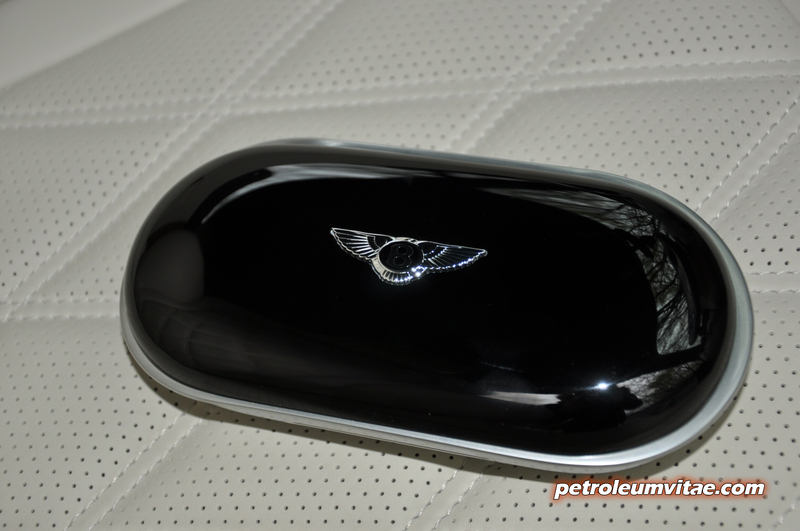 You can order yours in silver, with black leather. Cheers as always, Dave!